Upper Slaughter - The village of Upper Slaughter in the Gloucestershire Cotswolds is one mile away from Lower Slaughter and resides on a gentle grassy slope above the stream that connects the two villages. Once the village was dominated by a Norman castle but all that can be seen of it today are the remains of the motte and bailey. The building that dominates Upper Slaughter is the beautiful gabled Manor House which is one of the finest buildings in the area. The oldest part of the house dates from the 15th century but the front is Elizabethan. The Manor is now a hotel. Upper Slaughter is known as a Double Thankful Village due to all their then members of the armed forces surviving both World War I and World War II. The only other two Thankful Cotswold Villages having no fatalities in the Great War was Coln Rogers and Little Sodbury. 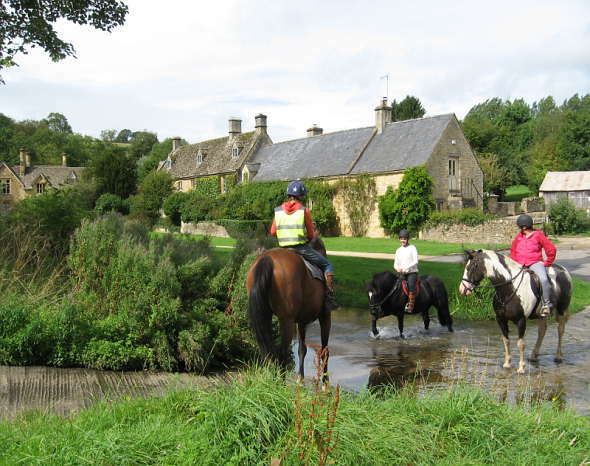 EYFORD House in Upper Slaughter has been named the nation’s favourite house by a national magazine Country Life in 2011. The property, a classical Cotswolds home in idyllic grounds where poet John Milton stayed and legend has it was inspired to write Paradise Lost. Guy Dawber (famous for designing other Cotswold homes) in the late 17th century style, with Baroque details. The house is owned by Serena Prest, who was given Eyford by her mother, Charlotte Heber-Percy. She inherited the house from her father Sir Cyril Kleinwort, who bought the estate in 1972. The Kleinwort family main residence is at Sezincote at Bourton-on-the-Hill near Moreton-in-Marsh. Walking around enjoying the wonderful countryside with places such as Stow-on-the-Wold, Moreton in Marsh, Bourton on the Water, and Broadway only being 14.5 miles away. Upper Slaughter is a quintessential English village, yet underneath the cosy veneer of small village life lurk many festering secrets. Enchanted by the village and its surrounds, Sarah and Phillip move into Primrose Cottage with great expectations. However, paths cross, fates twist, misunderstandings occur and the one issue that exists between Sarah and Phillip rears up, causing fissures in their marriage. Phillip thinks Sarah has left him, Sarah thinks a sexual deviant has kidnapped her, and a very close friend uses this opportunity to play the seductive predator. In the shadows of this previously idyllic setting, one man, a loner, seems to be in control of everyone’s destiny except his own. Despite the beauty of their new home, the journey for Sarah and Phillip is fraught with danger, anguish, and betrayal. the wavering flame of love's pallid candle. The Story behind 'Naked Slaughter' - the author wrote the following especially for Cotswolds.Info. Ask one hundred authors of fiction about what inspires them to write a particular story and you will get a lot more than one hundred answers. It can be anything: a person, a group of people, an experience, wishful thinking, a dream, a nightmare and so on. For me the inspiration for 'Naked Slaughter' was the village of Upper Slaughter in the Cotswolds. From the moment my wife, Jane, and I visited for the first time in 1997, Upper Slaughter became like a magnet for me. Every time we stayed in the area — Moreton-in-Marsh, Broadway, Burford, Blockley and Chipping Campden — I had to return. I would walk round the village in relative silence taking in every nook and cranny, every house and cottage, every bend in the road. But most of all I sensed the village’s aura; it had its own personality and magic. During every visit I always stopped on the footbridge over the River Eye and allowed my imagination to run wild as the water flowed beneath my feet. It was during my third visit when I saw Michael walking up from the ford towards the village green. I saw him walk past Sarah and Phillip Preston as they fell in love with Primrose Cottage. I saw Old Greg at his garden gate as he watched everyone and everything. Most importantly though, I saw how I could bring these products of my imagination together into a story that would allow me to recount the imaginary secrets of Upper Slaughter. I always felt that it wasn’t the people who lived there who were watching me, it was the village itself. The feeling was so strong I knew that to do it justice I had to encompass the nooks and crannies, the cottages and houses, the bends in the road and a lot more into Michael and Sarah’s story. The Cotswolds are exquisite, the towns and villages border on chocolate box perfection, but with the magic of Upper Slaughter you also get mystery. The village has its secrets which I'm sure it shares with no-one, so please remember; 'Naked Slaughter' is a work of fiction! Nigel Lampard was a Lieutenant-Colonel in the British Army when he retired from active service in 1999. Trained as an ammunition and explosives expert, he travelled all over the world and was appointed an Order of the British Empire for services to his country. As a second career, and with a post-graduate diploma in Organisational Psychology, he helped British Forces personnel transition to civilian life. During a tour in Berlin in the early 1980s he fell in love with the city, its people and its isolation. When he left the city in late 1983 he needed to continue the affair and the only way he could do this was to write about it, so he began writing his first novel. Other book titles by Nigel include — In Denial (set in Loch Lomond, Ashbourne, Derbyshire and Hong Kong); Obsession (set in Westerham, Kent); Pooh Bridge (set in Medbourne, Leicestershire, Germany and Brunei), The Loser Has To Fall (set in Sarawak, Malaysia during WW2 and Leamington Spa, Warwickshire) and Subliminal (set in Ashby St Ledgers, Northamptonshire). All of these books are available as e-books and/or paperbacks from Amazon . The books set in Berlin, his first two novels, will be published shortly.